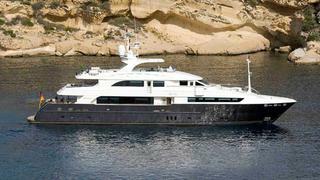 An understandably excited Alex Clarke at Denison Yacht Sales calls to say he acted for the seller in the sale of the 41.1m motor yacht Rob Roy, with the buyer representative wishing to remain anonymous as he's a friend of the owner. For guests there is a second master suite on the main deck, which has a walk in wardrobe. On the lower deck a double and a twin cabin plus a gymnasium with sauna. The gym converts into a cabin with three Pullman berths. The light, airy and chic contemporary interior features high gloss sycamore, silver accessories and marble. Rob Roy was asking $12.95 million.